As an artist, I’m committed to a nontoxic (or less toxic) art practice, which is safer for myself, my family, and the environment. Through my quest for artist-quality, nontoxic materials and techniques, I discovered that the process of experimentation—working with an idea in mind, but ultimately responding to the materials—is what truly makes printmaking a passion for me. I use Akua Intaglio (professional-quality, soy-based inks) in my woodblock prints and natural paper fibers, such as cotton and abaca, in my pulp-paintings. Working from nature offers endless beauty and complexity to explore, showcases themes that are important to me, and ultimately creates a unified connection between my materials and subject matter. My artwork features landscapes and other organic subjects, reflecting an appreciation for both the grand beauty and intimate details of nature. My inspiration is based in memories of time spent outdoors as a child and the need to reconnect with nature as an adult. I received my BFA from Syracuse University, College of Visual and Performing Arts, in 2001 and my MA in Museum Studies, also from Syracuse University, in 2003. I teach art and design at Montgomery College and have worked in the Education Department at the National Museum of Women in the Arts. I am a Resident Artist at the Howard County Center for the Arts, and I print using a Conrad Etching Press. I make paper at Pyramid Atlantic Art Center in Silver Spring, MD. My husband and I live in Baltimore with our two beautiful kids. We love to travel and spend time outdoors. Resident Artists Exhibition, Howard County Center for the Arts, Ellicott City, MD. May 8 - June 26, 2015. Critical Contacts: Significant Encounters and Their Impact, Exhibit of works by the Studio Art Faculty of Montgomery College, March 3–March 28, 2014, Capital Arts Network (CAN), Urban by Nature Gallery, Rockville, MD. In Perfect Harmony, Sahara West Library ART Gallery in Las Vegas Nevada, 2014. 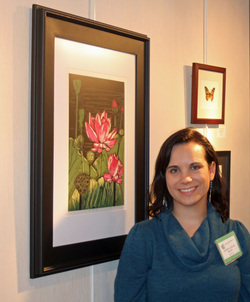 Resident Artists Exhibit, Howard County Center for the Arts, Ellicott City, MD. 2014. Resident Visual Artists Exhibit 2013, Howard County Center for the Arts, Ellicott City, MD, 2013. EVOLUTION: An Experiment in Artwork and Exhibit Creation, Traillworks, Newton, NJ. 2013. HOCO Open 2013, Howard County Center for the Arts, Ellicott City, MD. 2013. Form and Fabric of Our Lives IV: Artistic Gifts of the Season Exhibition, Willow and Garden Galleries at Quiet Waters Park, Annapolis, MD. November 14, 2012—January 6, 2013. Good Things, Small Packages, Traillworks, Newton, NJ. November 10, 2012 - January 5, 2013. The Teacher Behind the Work: Celebrating Howard County Art Teachers, 2012. Rouse Company Foundation Art Gallery, Howard Community College, Columbia, MD. 2012. Contemporary Landscapes, 2012. Traillworks Studio and Art Gallery, Newton, NJ. 2012. Growth, Renewal, and Change, Traillworks, Newton, NJ. April 11-June 9, 2012. Pyramid Atlantic Annual Juried Member Exhibition (juror: Kelly O'Brian), Pyramid Atlantic Art Center, Silver Spring, MD . April 9th-26th, 2012. Inspired by Nature (solo), 2012, Irvine Nature Center, Owings Mills, MD. Inspired by Japan (Woodblock Printmakers Collaborate to Support Relief Efforts in Japan). Exhibits in Oregon, Michigan, Minnesota, and Johannesburg, South Africa. Prints available for purchase here. Inspired by Japan 2011-2012. (Woodblock Printmakers Collaborate to Support Relief Efforts in Japan). Black and White, 2011. AACC Visual Arts Faculty Show. Cade Fine Arts Gallery, Arnold, MD. Subjective Sensibilities. 2008. Villa Julie College Art Gallery, an off-site location for Artscape, Baltimore, MD. Forest Through The Trees: Gelatin Monotypes by Amanda Gordon Miller (solo). 2008. Greenbelt Aquatic & Fitness Center, Greenbelt, MD. Featured Artist. Cave Wall, A Journal of Poetry and Art. Winter/Spring 2009. Article “Painterly Prints: Monotypes from a Gelatin Plate,” InPrint. Maryland Printmakers: September 2006.